The culmination of the glorious festival of Karthigai Deepam took place on Friday 5th December. 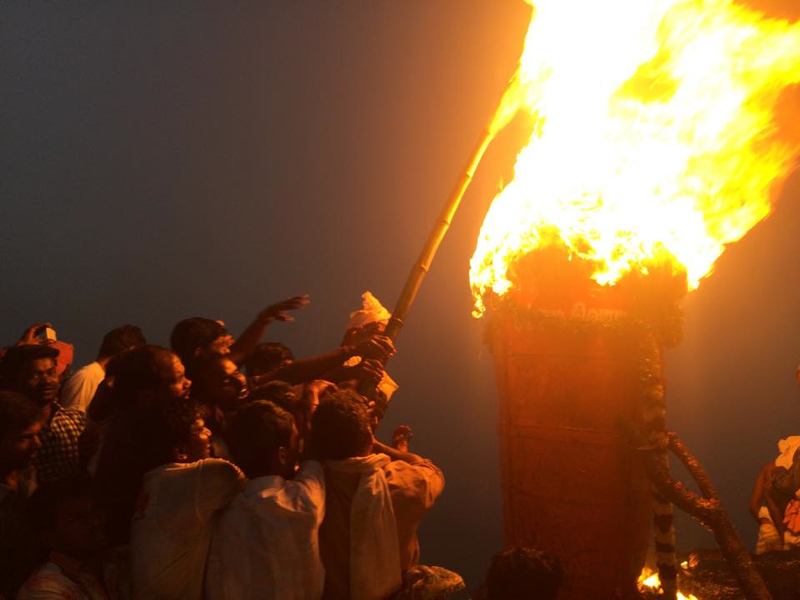 On this day the sacred flame or the holy beacon is lit on the summit of Arunachala hill. The prelude to the Lighting of the Great Flame started inside the big temple at 2 o clock in the morning. 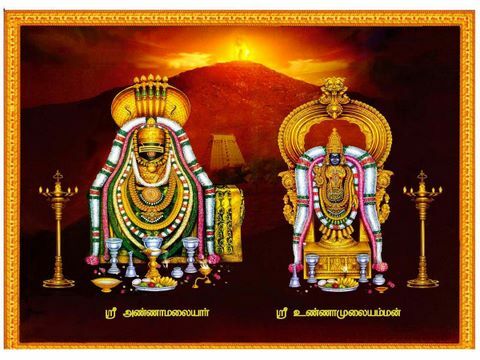 At this time, a Yagna or sacred fire Homa is kindled in the Mahamantapam while the Abhishekam to Lord Arunachaleswara is performed in the inner sanctum. After the puja, Arathi is done by the priests by lighting a huge chunk of camphor on a golden plate and waving it around the Lord. The temple bells start clanging and the musicians beat on their drums. Amidst all these sounds, the temple walls resound with loud cries of devotion. 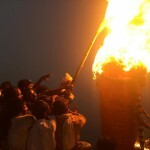 The Arathi is brought outside and shown to the five lamps lit on earthen plates for which the Yagna has been going on. This is Bharani Deepam, the prelude to Karthigai Deepam. Its significance is that the universal Lord manifests as the five elements during the day and in the evening He again becomes the One Absolute Being and shines as Tejolinga when the Deepam is lit on the Hill. (Bharani is one of the 27 stellar constellations through which the moon is believed to pass through successively each day and according to the hindu almanac, Bharani precedes Krithika which is the constellation of Karthigai Deepam). The earthenware lamps of Bharani Deepam are taken in procession around the temple. A fire torch is lit from the fire of these lamps and taken to the Hill top. Here on the summit there is a huge copper cauldron filled with ghee (poured in by devotees) and a wick made from many metres of cotton cloth rubbed with camphor after being steeped in the ghee. Millions of people have already arrived since morning and start walking giripradakshina around the Hill. The roads are packed with an ocean of people still increasing as the day goes by. 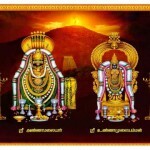 Around sunset, at 6 p.m. to be exact, the deity of Lord Ardhanaareeswara is brought out ceremoniously and installed in the DeepaMantapam in the big temple, facing the Hill. After Arathi is shown to the Lord, a thundering blast of fire crackers gives the signal to the men on the summit of the Hill to light the Flame. It is a Full Moon night and as the sun sets in the western sky and the beautiful full moon rises in the east, the flames of the Maha Karthigai Deepam spring forth into the sky on top of Arunachala, creating a wave of ecstatic devotion among the people. A tremendous roar of “Annaamalaiyurukku Haro Haraa” is heard from all directions. The Deepam burns brightly and fills our hearts with the powerful and vibrant presence of the Lord. Everyone stands awe-stricken in front of this splendid sight and thousands fall down on their hands and knees doing Pranaam to the Great Lord. And thus the great festival of Deepam is completed. However, True Completion happens when it is not only outside with the Lighting of the Flame on the Hill but also inside when the Flame of Jnana is lit correspondingly in the Heart of each being.